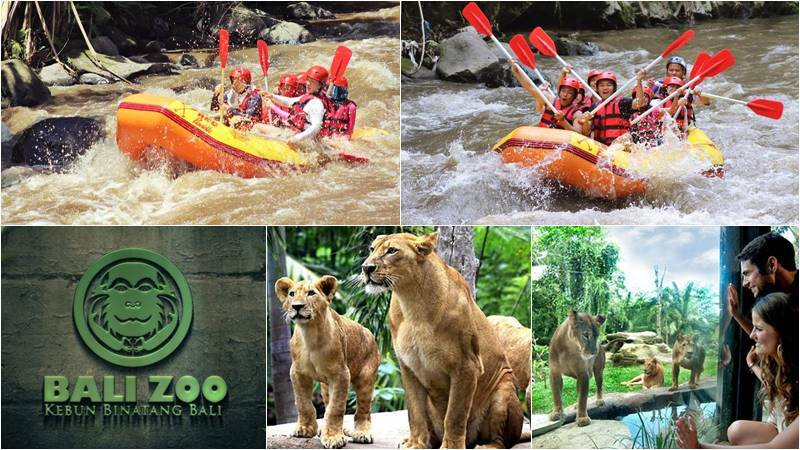 Bali Rafting + Bali Zoo Tour is an interesting tour package for Bali Rafting, in which you can enjoy Bali Ayung River rafting and then combine your visit to Bali Zoo. The park is situated in the art village of Singapadu and covers over 22 acres of lush landscape and houses a diverse collection of over 350 exotic animals, most of which are Indonesian, including rarity and endangered species, such as the Sumatran Elephant. 13.30 – Visit Bali ZOO. 16.30 – Transfer back to hotel. Your Bali Ayung river rafting tour begins with morning pickup by our driver with private air-conditioned car from your hotel in Bali and drive through the countryside and arrive at village of Payangan, Ubud Bali. After all participants are equipped with rafting equipment including lifejacket and helmet, it is time for you to experience a truly unique and memorable epic journey thru winding gorge, luscious jungles, and wild life in its natural homes. Paddle through astonishing waterfalls for unparalleled river fun. Our trained professional guide with internationally accepted equipment will guide you through about 12 km of exciting grades II and III rafting. Your safety is our highest priority always and after 2 hours of fun trip. After your shower and change, the Indonesian Buffet Lunch will be served to you while you enjoy views from the stunning restaurant and relax in a peaceful atmosphere of Bali. In 2002, the Bali Zoo opened as the first and only Balinese-owned zoological park on the island, which remains true today. Located in the art village of Singapadu on 22 acres of lush landscape, this zoo houses a diverse collection of over 350 exotic animals, most of which are indigenous to Indonesia, including rare and endangered species such as the Sumatran Tiger, Sumatran Elephant, Sun Bear, Orangutan, and Binturong. Our animals live in hundreds of quality eco-habitats and are very well looked after by our 170 friendly staff who work in our extended zoo family. The Bali Zoo is centrally located in Bali’s cultural district of Gianyar Regency, close to the Kuta, Sanur, Seminyak and Nusa Dua tourist areas and just 15 minutes by drive from Ubud. Mr. Anak Agung Gde Putra designed and developed it independently in his own village of Singapadu, in the Sukawati district of Gianyar. It was created primarily through a love of animals, followed by a desire to preserve and protect various Indonesian fauna, and a desire to give the public ways of sharing this wonderful experience with locals and tourists alike. All in a well-designed environment of natural beauty which is also clearly Balinese. In 1996 Mr. Anak Agung Gde Putra started to build the zoo using his own finances and in September 2002 the project was completed after six years. In spite of an important set-back after the Bali bomb disaster, which crippled tourism a month after the zoo was opened, Mr. Anak Agung Gde Putra persevered with his views and tried to further raise Bali Zoo to the level of an international zoological park. Bali Zoo offers a range of unique and distinctive experiences during your visit. Bali Zoo is not only a place to observe, learn and enjoy exotic fauna, but also to engage in various family activity from our beautifully landscaped and shaded garden trails that take you to our different’ hands-on-‘ animal encounter sessions throughout our garden, where you can feed, pet and take photos with a number of our zoo residents. All of these are part of our commitment as the Island of the Gods leader zoological park to conserve, research, educate and recreate. We also have two different restaurants serving food from 9 am to 6 pm as part of our unparalleled zoo experience. Our large Elephant View restaurant is located in an ideal location in the middle of the Park, with 300 buffet or à la carte restaurant offering magnificent views of our elephant trail and tropical gardens, while our Wana Restaurant, named after the famous Botswana delta river valley, is near the entrance to the Zoo. This two-story rustic restaurant is a perfect place to see our lion’s den from Africa where our lion family resides, while you have dinner in western cuisine or our selection of delicious desserts. Ticket for Bali Zoo Visit.